To a Scorpio Snake, life without beauty and luxury, tenderness, compassion, admiration and extravagance is not worth living. This person is sensitive in the extreme and, for a cool-handed Snake, remarkably warm-hearted and loving. People appreciate this character for a certain innate nobility, which is both unquestionable and very comforting. Scorpios are already very sensual people with a tendency to introspect and suspect. 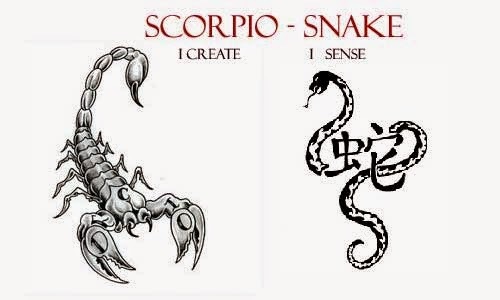 To add the Snake characteristics of sagacity, clairvoyance and intuition certainly doesn’t diminish the philosophical side of Scorpio’s nature. This person is deep-thinking, sometimes even tormented. There will necessarily exist in Scorpio Snake’s makeup a flamboyance and attention to wardrobe that sets him or her apart from the rest of us. You will never see a shabbily dressed Scorpio Snake. They may be said to push personal appearance to the limit. Their manner of getting themselves up might even be called “costuming.” They are invariably arrayed in finery so unusual as to be stunning, and fit only for their type of personality. This person has a native ability to intuit the needs and desires of others. He or she is able to understand nuances that escape even the most discerning audience. Scorpios born in Snake years have a kind of special genius for picking up hints and following hunches that takes them very far in a worldly way. It may be something as simple as guessing the direction a stock will take or foreseeing the need for a certain market in commodities or goods. Scorpio/Snakes are not often poor. The variety of superiority that the Scorpio born Snake possesses is of near cosmic proportions. You cannot encounter a Scorpio Snake and come away from said meeting without a vivid picture in your mind’s eye. unspoken charisma is just there. As you might have already guessed, the Scorpio Snake’s ego fares well. There is a very healthy sense of self here. But Scorpio Snakes don’t let their ego get too far ahead of their inner logic. They strike a careful balance between reality and dreams. Oh, they are capable of lying. The famous Snake powers of dissimulation are very active in this subject. But Scorpio Snakes don’t often lie to themselves. They like to maintain a cool head no matter what cloud tempts them to climb on for a joyride. Scorpio Snakes are jealous people. They want to keep everything—especially power—for themselves and their loved ones. They don’t like to share the spotlight and they make no bones about it. As Snakes go, the Scorpio is not too lazy, either. He’s so avid for gain and attention that his ambition keeps him moving. Fact is, he doesn’t have to make much effort to succeed. It comes naturally. attracted to such a person, it’s no surprise. It’s not even your fault. If you like being outshone in public, take up with one of these stars. You had best enjoy staying home and burning those fires because Scorpio Snake will be out slaloming through the admiring hordes whether you like it or not. The Scorpio Snake home will be large and impressively decorated. Silks and brocades abound. The last little pickle fork will have been hand-fashioned of vermeil. Luxe ain’t the word. Posh is more like it. The Scorpio Snake resides in a decor comparable to his stature and opinion of herself. The Scorpio Snake parent is serious but likes to be quite indulgent with little ones. He or she will spoil children materially but demand that they appear like ladies and gentlemen for company. There can be a problem of jealousy here. Scorpio Snakes don’t take kindly to competition for attention. If the kids are too charming, Mom or Pop might freak. The house should perhaps be outfitted with wall-to-wall spotlights. These kids will be, first of all, extraordinarily attractive. They will probably have tobe protected from admirers and taught that there is more to life than being an eyecatcher. They will also tend to fib. Don’t wash their mouths out with soap. Show them instead that you have seen through them. Scorpio/Snake kids operate best when parents are firm but loving. Don’t be seduced by this wily beauty. He or she needs you, the parent, to represent truth. This person is mostly creative. He or she will take to all activity wherein the spirit of invention is useful and applicable. Scorpio Snakes might work well alone but can fit into the system, provided the system recognizes their superiority and remunerates it accordingly. Bossing suits the Scorpio Snake best. He will be a reluctant subordinate. If he is the boss, you can expect him to be democratic and understanding of his workers. He likes to have power, but is not one to wield it unless crossed or pushed. Then, watch out. Scorpio/Snakes are ruthless and attack their enemies pitilessly. Competition? Never heard of it. Natural careers for this super Snake are: king, queen, movie star, pope, and so on. But in reality, if they have to actually work at jobs, they might like to try: modeling, acting, advertising, or stocks and bonds. They make terrific artists, too.